Today we sit down for an interview with private investigator Lee Alvarez, the star sleuth of author Heather Haven’s Alvarez Family Murder Mysteries. Soooo much better. I mean, she really has me running over rooftops, down and dirty in the mud, being shot at, etc. You name it; I do it. I can’t tell you how many of my shoes have been ruined since I met her. I keep asking her why she won’t let me sit in my client’s office snooping at online files, sipping a double latté, while wearing my latest Vera Wang find. I simply don’t get it! What did I ever do to her? For instance, in my last adventure I am in disguise as a dishwasher at a cooking school. I can’t tell you what that did to my nails. My manicurist sobbed like a baby. The glass is always half full. I’m a positive, upbeat sort of person. I love life and everybody in it until they prove to me I shouldn’t. Which many of them do. That’s more or less a PI’s lot in life, the hardened criminal. Here I am, about as hard as a two-minute egg. But I don’t want to be any different. Embrace life, I say. Give people the benefit of the doubt. Take care of small animals and those less fortunate. Salute the flag. Let’s face it, I’m a walking Hallmark card. Sometimes I leap before I look, but I try to watch that. You don’t want to be leaping into something that could hurt your Jimmy Choos. And I’m impulsive by nature, hot-blooded, all that Latina stuff. I try to be even-tempered. I try. 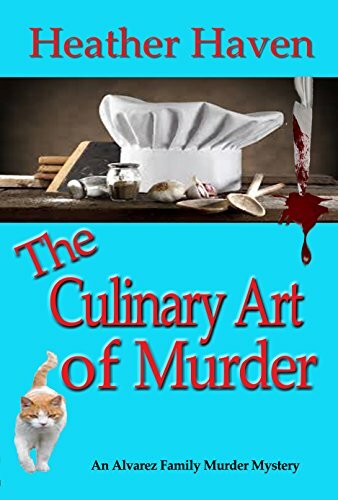 In the latest book, The Culinary Art of Murder, she puts me in a disguise that makes me look just like Albert Einstein. I wear a salt and pepper wig, sort of like a Brillo pad on steroids, false buckteeth, and thick glasses. Baggy black pants, a huge white shirt, and imitation Crocks on my feet complete this ghastly getup. I am a real bow-wow. And then to add insult to injury, I get to stand on those feet and wash about a gazillion dirty dishes, pots, and pans while trying to find a killer. What I do for a living! You’re kidding, right? Argue with Heather? Not me. I tend to roll over with all fours in the air and bark. That people won’t read about me and my family’s adventures running a detective agency in the heart of Silicon Valley. I might have to go out and get a real job. Well, I’m pretty blessed. I have a great life, a great job, barring a few scrapes and bruises here and there, and let’s not mention the time I was shot. But I got married recently to a wonderful guy who thinks I’m about as great as I know he is. I’m working on having it all. I mean, why not? Well, there’s two things: One – I can’t sing worth a tinker’s dam, which is too bad. I love to sing. But my brother says I have a voice that can clear out a stopped up sink. And two – The biggest love of my life is ballet. Unfortunately, I wound up being a so-so ballerina, no matter how hard I worked at it. Not much of a choice – mediocre dancer or first-rate sleuth. But I still do a barre every day. At that time, I’m as good as Pavlova, if only in my mind. My mother makes me crazy. I say this because Lila Hamilton Alvarez is perfect. Really, truly. All my life I have lived in the shadow of the most beautiful, in-control, stylish, intelligent, and knowledgeable woman on this planet, my mother. But there’s another side to her, which is really annoying. Example: I’m told I take after my father in nearly every way. Dark hair, twilight colored eyes, fiery temper. When I was a kid, everybody would say, “Lee’s got her daddy’s features and her mother’s fixtures.” But nobody ever said that around Mom. Way too crude. Gender-based innuendos are not made around L. H. Alvarez. She would be scandalized. My mother also can’t tolerate people who use abbreviations (like I just did) or nicknames, such as calling me “Lee.” She’s called me Liana, since I dropped out of the womb. Whoops. Scratch that remark. Back to being crude. I don’t think anybody. My philosophy mirrors Oscar Wilde’s - Be yourself. Everyone else is already taken. I think Heather is a pretty nice lady when I can get past how she sends me out and nearly gets me killed every time I turn around. But she does let me wear designer clothes and I do have the occasional zinger to say. Now if she’d just get me valet parking wherever I go, we’d have something. You can find Heather at her website. She loves it soooo much. Says it really shows who she is. And I’m featured nicely on it. Actually, all of us characters are. She’s real fair like that. Heather’s got me hopping! The seventh of the Álvarez Family Murder Mysteries will come out next year, Casting Call for a Corpse. She hasn’t started it yet per se, so I’m fairly safe for the moment. However, what she’s working on now is the second book of the spinoff series, The Lee Alvarez Mystery Novellas. This series features hubby, Gurn Hanson and me. We’re sort of a Nick and Nora Charles in today’s Silicon Valley. The first book, Honeymoons Can Be Murder, is already out. She’s merciless, almost getting me killed in book one, even though I had a sprained ankle. Now she’s writing Marriage Can Be Murder, book two. I’m crossing my fingers I’m going to make it through another one of her stories. Mercy, Heather, mercy! I love these interviews or blogs about the characters in books. Great job on this one. I also loved that line "roll over on all fours" very creative. I love your sense of humor also. Thank you, Angela and Roseanne. I have a good time with Lee.